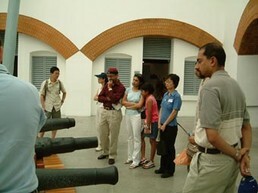 On Saturday 5th July 2003 more than 15 members and guests of the Hong Kong branches of the Nautical Institute and the Institute of Chartered Shipbrokers went to Shau Kei Wan to visit the Hong Kong Museum of Coastal Defence. Formerly known as the Lei Yue Mun Fort, it was built by the British forces more than hundred years ago to defend the eastern approach of the harbour. It was considered to be the most sophisticated fortification of the time. During the Japanese invasion in December 1941, the Fort was an important battlefield where heavy bombardment took place, causing considerable casualties to the defending forces. 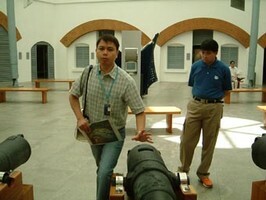 Today, the Fort has been restored into a museum to preserve and present the Hong Kong history of coastal defence from the Ming dynasty up to the present time. Members agreed this was a very interesting visit, which will certainly be repeated in the future.